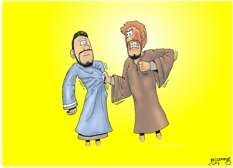 Bible Cartoons: Psalm 118v6 - What can man do to me?! 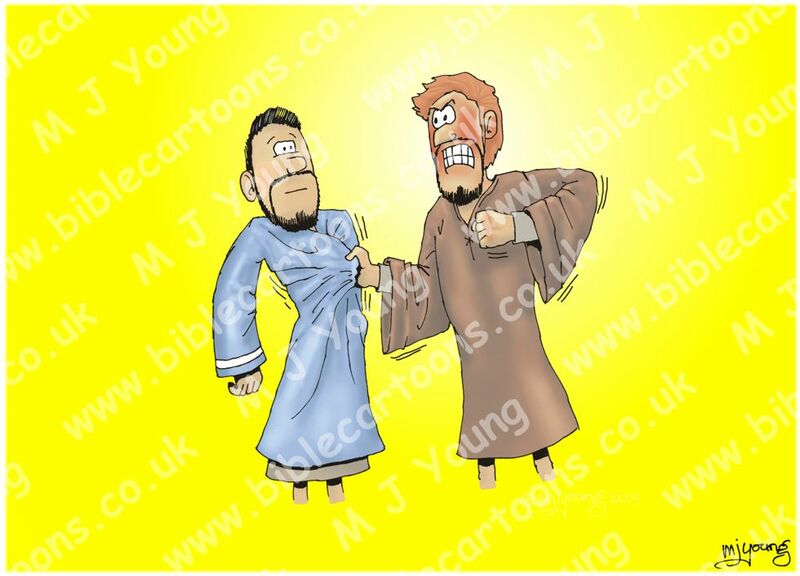 Bible Cartoon: Psalm 118v6 - What can man do to me?! Psalm 118 is an example of a psalm of Thanksgiving, which describe a situation of distress & how God delivered the psalmist. The phrase “What can man do to me?” is the key to this very early cartoon. I imagined one man threatening another, who is aware of his predicament, but not too concerned, as he trusts in the Lord. In a sense, although one man can thump another, he can not do anything to the other’s soul: he can not harm the inner man. Though our outer bodies can be killed, our soul’s final resting place is only subject to God; it is beyond anyone’s power to affect, except His.